It's always more fun to ride in a group!!! Getting together with a bunch of like-minded people who share the love for being outside and riding trails as you do. Many times it's hard to find a group of people who have the same schedule and can ride at the same times. And it's even harder for young girls who just want to get out and rip some trails. We have the solution! The Little Bellas Winter Ride Program! The Benton County, AR Winter Ride Program meets every Sunday throughout the winter various other trails in the area. This is the next level of the Little Bellas. Open to girls of all abilities, the Winter Ride offers the girls a unique opportunity to learn how to ride mountain bikes from our most experienced mentors. Still based around having fun, the rides take them on trails they may know, trails they may not know, and really gives the girls a chance to try, learn, or hone their skills. Bring plenty of layers! Layering is key to keeping warm! Schedule:This program will about riding, skill development, and exploring trails networks throughout the region. The schedule will not include games and curriculum elements similar to the weekly program. Kelsey "discovered" mountain biking accidentally in the 7th grade with a friend when a detour on a ride took them on a newly made trail. She never looked back. Working at BikeNWA, she helps to get more people on bikes and to make Northwest Arkansas as bike friendly as possible. Road, mountain, or cross, if you pedal it and it has two wheels, Kelsey wants in. 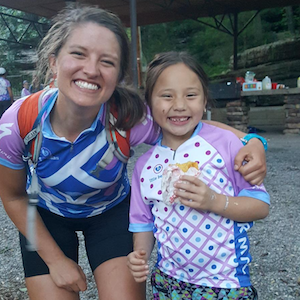 Her amazing dedication to cycling and a general joy for life always shows through whether she's making up TV shows for Little Bellas campers to "watch", hanging out with her dog, Nancy Drew, jumping in a mountain bike race, or quoting Meryl Streep movies.